One of the most difficult aspects of designing for the mobile web is making your site compatible and accessible across different devices. A mobile-optimized site might look great on your iPhone or Android device, but utterly fall apart on Symbian or BlackBerry handsets. Likewise, a simple WAP-enabled site might be fine for feature phones, but fall short of expectations when it comes to newer and more advanced devices. Today, we want to take a look at some specific tips and tricks for testing and adding compatibility for different types of devices. It’s natural to want to make your site look absolutely perfect on every possible device that could access your mobile site. However, this just isn’t practical for the vast majority of developers and designers. Instead of trying to support every platform out there, set out some goals for your site and your potential customers. For instance, if you know that most of your users are going to be using an iPhone, focus on making an iPhone-enhanced version of your site first. Conversely, if you get a lot of traffic from parts of the world like Asia, the Middle East and South America, you may want to focus your primary efforts on Symbian. It’s also important to remember that at this point, the vast majority of the next generation of mobile devices use the WebKit rendering engine for their web browsers. 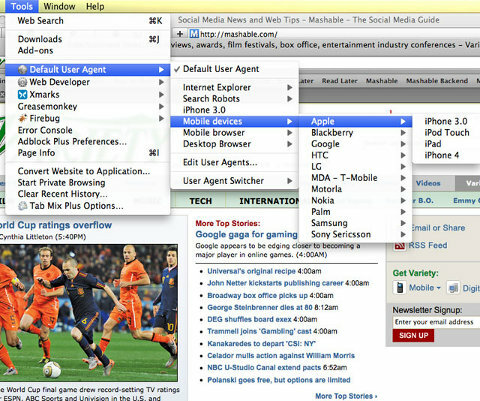 Nokia uses WebKit for its S40 and S60 built-in browsers, Apple uses it for Mobile Safari, Palm for webOS, Google for Android and the upcoming BlackBerry 6 will have a WebKit-based browser, too. Just because they all use WebKit doesn’t mean that all devices will render content the same way, but it does give you a good baseline of what sort of browser engines should be tested and focused on. If you don’t have access to every major device type that you want to check, you can still get a good idea of how content will look on other devices by using mobile emulators. Including a mobile-specific stylesheet on your main site with certain parameters that add or subtract features, based on what device is being used, can be an elegant and effective way to serve content across multiple devices. Dominique Hazael-Massieux wrote a great article for A List Apart last year that covers some of the basics and also links to some of the most common parameters for handheld support. Dave Shea included his own solution back in 2008 that is still pretty usable for lots of devices. More recently, Chris Coyier at CSS-Tricks discussed how to add in screen size and browser support via CSS or jQuery, and he includes his own downloadable examples. Dave Calhoun has some excellent suggestions in his series on mobile web development. If you want to get on-the-fly feedback of how your site will look while testing in your web browser, just change your user agent. Each device carries a user agent string that can be used to tell web browsers what type of device it is. Safari and Firefox both offer easy ways of changing your user agent so that you can get a glimpse at how content will look on other browsers. In Firefox, download Chris Pederick’s User Agent Switcher. To add more mobile browsers to the plugin, see this comment. If you use a content management system like WordPress or Drupal for your site, your best bet might be to use a mobile plugin. WordPress, for example, has the popular WPtouch plugin. There are free and paid versions of the plugin and it works with a variety of devices and you can even specify which devices you want to use the mobile stylesheet and which devices you want to load the full page. Meanwhile, Drupal also has lots of mobile plugins, including the aptly named, Mobile Plugin. How do you cross test for mobile browsers? Let us know! Previous post: How to add a ‘Print this article’ option in a WordPress blog?